Still life with brushes on Kodak Ektar 100 5x4 film. Pingliang Road, Intrepid Field Camera and Ilford Delta 100 film. 1/2 sec at f45. I’ve done enough street photography now that I routinely overcome my nerves, although there are times when that familiar flutter in the stomach returns. I recently heard a comedian say that nerves can be turned into a kind of positive energy. I think I do that these days when I remind myself that I’m doing a ‘job’ - the noble job of photography - and that street is a place where the work has to be done. It’s a little mantra and a form of self-permission and motivation. When I’ve captured some frames, my nerves settle down. Being in China with the 5x4 Intrepid Field Camera, my nerves were very much present. In point of fact, not since my first forays in public with a camera in hand had my nerves been quite so evident. A discomfiting feeling for sure, but also a life-affirming one. My senses were alive and I was all the time reminding myself about what I’d decided to do. I had come to China. I was going to do 5x4. My nerves were not helped by the proportional nervous and suspicious looks I received from Chinese security guards, at what felt like every ten or so yards. There are a lot of such workers in Shanghai. It helps you to feel safe, but you are being watched. Looking back, it may have been something to do with my newly purchased plastic Nikon branded tripod. This I had bought over in China, solely for the purpose of shooting with the Intrepid. The plastic beast came with a convenient black carry-case. You know, a sort of roughly ‘gun’ sized case. A case carried by a conspicuous white man who had turned up in busy areas looking nervously at security guards, walkways, entrances, exits and the crowds. Eventually, I learned to bag the case and carry the tripod with some leg extension - so it looked like a tripod. Everybody relaxed. The Huangpu River, Shanghai. What a great location for my Intrepid camera and Delta 100 film. I didn’t have long to shoot large format in China. I did a fair amount of scouting for locations whilst shooting 35mm, but probably did no more than the equivalent of a day with the Intrepid. I set the camera up fully on three occasions. Each time was quite magical; the locations, light and people around me each a contributing factor. On the first occasion I drew some modest attention. One gentleman in particular was quite taken with my red-bellowed companion. He stood for some time watching me work, to the point where I began to give a silent tutorial on the shooting procedure. I know not if he wanted that, but it seemed the polite thing to do. The second time I set up the camera I was decidedly braver in my choice of location - I was in a back alley in the suburbs - but I was much more shocked by the reaction of passers-by. There simply was no reaction! I thought I was bound to be approached by the workers who came out of an adjacent building, but no, they walked around me as if I wasn’t there. I chuckled at my self-consciousness. 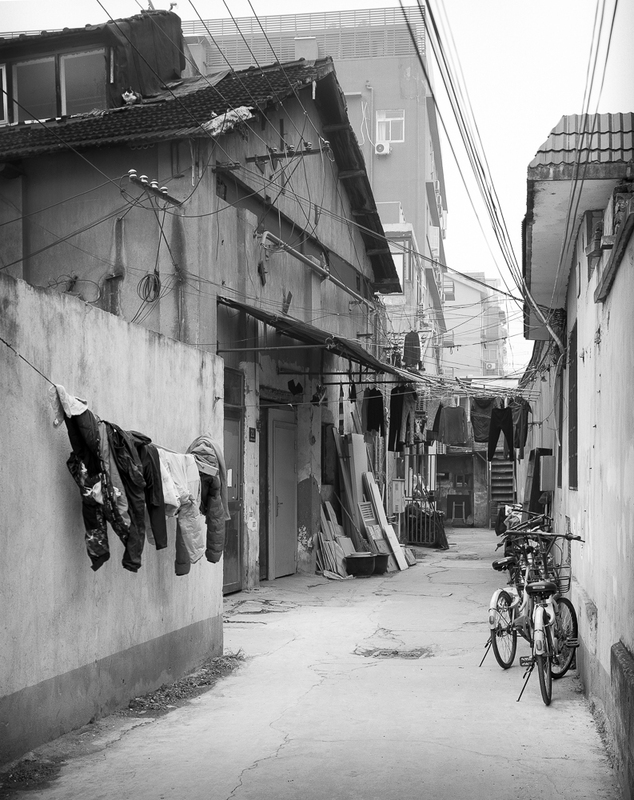 An alleyway in the suburbs of Shanghai. The details that 5x4 picks up in a shot like this are fabulous. I particularly enjoy the cat on the roof, top left. The last time, on a car park with derelict buildings, a car drove into my shot at the worst time possible. Just when I began my curses, he suddenly reversed away. I was back in the zone when I was interrupted again. This time a joyous ‘CAMERA!’ was shouted in my direction. It was the driver of the car as he triumphantly skipped by. We exchanged smiles and I thanked him silently for respecting the shot. Well, I like to think it was respect. I was attracted to the contrasts apparent on this car park. I framed a shot of the derelict building in the centre, with the slick buildings of modern Shanghai behind in the mist. Despite choosing a shutter speed of 1/2 sec, I chanced including a figure in the centre. He stopped to look at me, but I really wasn't confident I'd arrested any movement. The finished image can be seen above, at the start of this post. So what of my experience of using the Intrepid on this trip? And what have I to now add to my original review? Two important things stand out: one is the relative compactness of the camera; the other is that I really hardly noticed the camera at all. I was conscious of weight and bulk on my trip, a factor that led me to equivocate over whether or not to take the Intrepid. Having solved the tripod issue, I further reduced my load by forsaking my usual Manfrotto backpack. For this generously padded pack, I substituted my thin branded urban rucksack, inside which I placed a light generic camera bag to protect the 5x4. The film holders and darkcloth sat neatly on top. While the fit was a little tight, it did provide the further benefit of being very inconspicuous. With that rucksack on my back, I was truly in urban mode. To be able to carry a 5x4 camera in such a manner is a real testimony to the design of the Intrepid. My improvised arrangement for China has made me reconsider my normal backpack: I was left with the strong sense that I had previously been carrying more bag than camera. This was a huge plus for me working in an urban environment, but it is of even bigger benefit for those wanting to work in rural and remote locations. If you are not carrying around a lot of film holders or alternative lens choices, weight is not an issue at all. Setting the camera up and down was a pleasure. I suppose I have now developed enough muscle memory that such actions are smooth and automatic. There really aren’t a lot of adjustments to contend with. For some large format photographers in some situations this will be a problem, but of course, it very much depends on the work you are doing. As I have written before, if you are starting out in 5x4, the Intrepid makes a forgiving companion. It’s a great ‘learning camera’. This is what I mean by not noticing the camera. At each location I was fully immersed in making the image, and my control of the camera and exposure really did flow. I’m pleased with the images I made given the time I had. Interestingly, I think I was shooting 5x4 while still somewhat in a street photography mode. I elected more than once to include a passerby, chancing my arm with borderline shutter speeds and using my intuition somewhat for compositional placement (after all, you have gone ‘blind’ once the film holder is inserted). This may be suggestive of further personal work; crucially, for the Intrepid, it shows how it can be used quickly and with ease in public locations. I wrestled with the edges of the this image, and, not having further space behind me to retreat into, had to settle for the composition seen here. A lesson in camera positioning for sure, but I do enjoy the tonality that Delta 100 provides. A street photography / large format hybrid perhaps. I have one small caveat. I find that the front standard doesn’t ‘lock down’ as fully as I’d like, and is prone to moving around its central tightening screw. I pondered in my original review whether the wooden bottom of the standard would be hard-wearing in the longer term. It’s not the wear that now strikes me as the issue so much as the movement. Now, this movement might simply be a feature of my own copy of the camera, but my suspicion is that it isn’t. I have just taken possession of the new 10x8 model, and I’ve noticed an addition that solves the issue entirely. They’ve included some small grip pads on the standard’s bottom (think sandpaper stickers and that describes them well). I don’t know whether this is in response to feedback, or simply Intrepid’s ongoing commitment to design refinement at work. 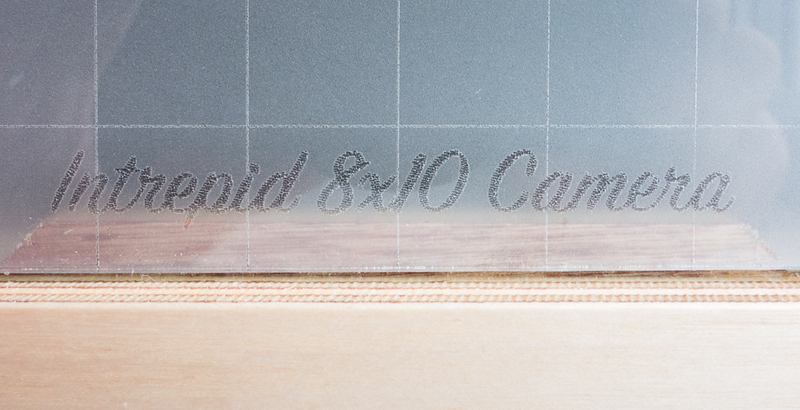 Either way, the change is welcome and points to an easy user modification to the smaller 5x4. The front standard on the 10x8 is very solid when tightened. I certainly fulfilled a personal ambition by shooting 5x4 in China, and you will gather from the tenor of my report that I continue to recommend the Intrepid for such a task. I’m looking forward now to doing some work with the newly arrived 10x8, a whole different challenge again. It’s funny that I’ve been in the habit of referring to my 5x4 as ‘the big camera’. That mantle has been lifted from it by the newly arrived 10x8, a camera that dwarfs it by comparison. The 5x4 looks tiny now, but it isn’t just the size comparison that has left me with that feeling. Using it in China has made me realise just what a compact large format camera it really is. My Ferns 5x4 image, now printed on A3+ paper. 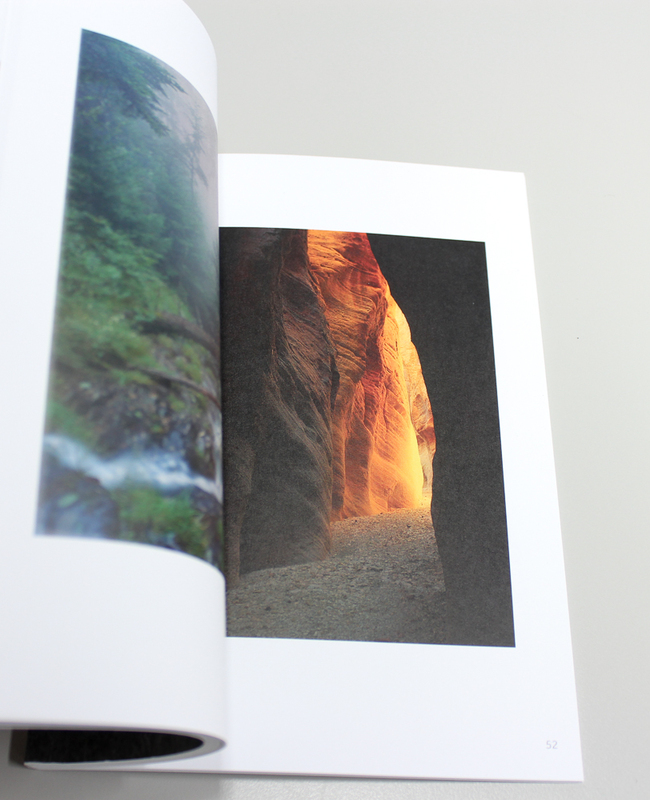 I used Canson Baryta Photographique, a paper which reproduces the generous detail really well. Sometimes it's good to be wrong. 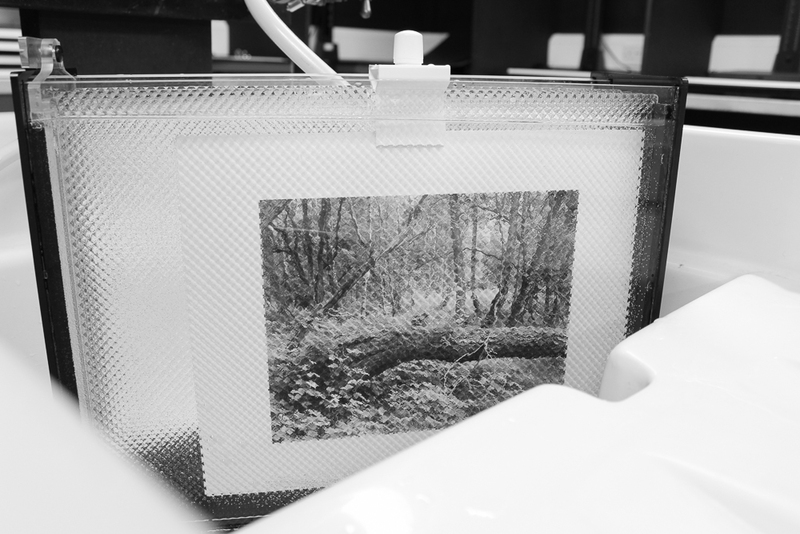 Not so long ago, I wrote about my experiences of printing one of my 5x4 negatives, and recorded my dissatisfaction with the image as a print. Readers of this blog will recall that I was especially disturbed by the large shifts in focus; I found myself putting this print on A4 paper to one side. The other day I decided to re-visit the file and printed it onto A3+ paper. The result was a revelation. The focus issues weren't gone - I would hardly expect them to be - but they were certainly different. Crucially, they weren't nearly so distracting, making the print much, much more satisfying. The print with a pen to give an indication of size. There are a number of factors at work here, but the key one is clearly the size of the print. I think there is much in the idea that an image 'wants' to be a certain size. There are relationships of depth of field, subject and background interactions, detail and subject placement that pull or push against a given size. Perhaps it shouldn't be a surprise that a 5x4 negative is leaning towards a bigger physical form in the final print. I'm happy because this is the difference between 'this negative isn't going to make a piece' (of photographic art) and 'it is' ... just. For the time being I'm especially pleased to see the beauty of a negative realised in such a way that it hadn't been before. It is an image with some compositional and timing strengths, so this is a win for me. The other day I came across my copy of T.J. Clark’s book Farewell to An Idea. It is a splendid work of art history, one that positively crackles with the most detailed and painstaking descriptions of Modernist artworks. As I flipped through the book, I remembered in particular the passages on Jackson Pollock’s paintings. Looking back, I had read and re-read these passages, almost as one might enjoy a novel. Clark is an intellectual heavyweight in the old manner. He set up a masters degree in the 1970s called the Social History of Art, dedicated to a Marxist approach to art history. I studied on that programme in the late 1990s, under the tuition of Jasper Johns expert Fred Orton, amongst others. While Clark’s book is hardly light reading, it does repay the hard work it demands of the reader. Now, I write that Clark’s descriptions stand out, but it isn’t just that these are careful and rigorous, which they are. There’s something more. They are object lessons in how to read a work of art. Clark makes every effort to convey the richness of the works he grapples with; it becomes a time consuming process of looking and looking again, a process that demands equal care with writing. The writing is not an afterthought, a means to an end in the descriptive enterprise, but a poetical analogue of the condition of paying close attention. This is perfectly in line with Clark and his ilk, who believe that canonical works of art repay that kind of close treatment. Unlike so many art historians though, Clark has learnt the figurative and rhetorical potential of his prose, and I can’t help feeling that his search for the ‘right’ phrase (a mirage of course) is a figure for our search for meaning in the painted and other material forms. As is the tradition in so many of these blog posts, I make a recommendation to the photographer. Spend some time with Clark (or a Clark equivalent) and see how he describes the artwork. Think about how such a careful approach might be applied to a photograph - a canonical one, of course, but perhaps yours or a friends, too. Photography is so often a descriptive business. I’ve written on these pages before that there is much to learn from carefully looking at the work of others, and an analysis of composition, tone, mood, and so forth is the nuts and bolts work to be done. This not only helps us to appreciate the finished image, but sharpens our skills of looking and in turn informs our visualisation. Indeed, as I continue to grapple with learning large format photography, I’m struck by how that format offers up a picture to be read right at the start. Under the dark cloth one has time to survey the flickering camera obscura image as if it were the final print. The Clark pacing to and fro in front of Pollock’s paintings in MOMA would be a wonderful mental guide to critical and rigorous decision making at the time of exposure. I can envisage him asking us to trace a line here, shift a little there, re-think depth of field, interpret a tonal shift. You would be right in thinking that this is not unlike the procedures recommended to us by experts like Ansel Adams, but the point here is that our resources stretch much further than the discipline of photography alone. And there are riches out there indeed. I have become increasingly aware of a little problem in my work on 5x4 of late, and it is, amongst other logistical issues that come with 5x4, a reason why my large format adventures have stalled somewhat. I’m still very much in the early stages of my work with the format, beginning to learn the craft, feeling my way, and asking myself how I will ultimately use it - assuming I continue in the longer term. It is part of my photography philosophy that an outcome must be determined for a particular process. The ultimate form the image will take determines camera choice, development, digital processing or whatever. If this is a print - and it mostly is for me - the desired dimensions, paper choice, whether it is darkroom or digital, will clarify, and to some extent dictate, the workflow that leads to it. I see too many people who put the cart before the horse: they spend hours researching and pondering their ideal camera, and yet show little or no awareness of the kind of image they wish to make. When one studies the results of one’s workflow, a cycle of reflection develops and information fed back to the shooting stage. This is a key ingredient in the craft of photography: the photographer is able to visualise the finished image even before the shutter is pressed. More practice with a given workflow leads to more technically refined images, which in turn leads to a more fluid expression of artistic ideas. So onto my issue with 5x4. The nub of the matter is that I don’t have access to a 5x4 enlarger, and so can’t make a darkroom print. I have made contact prints of course, but this is not the goal for me (and I would wager for most people using 5x4, the negatives just make prints that are too small). 10x8 would be a different matter, but 5x4 wants to be enlarged. Why else are we shooting 5x4 if not to make big prints? There may be some residual and aesthetic properties flavouring the scanned image when looked at side by side with a digital counterpart, but it is hardly night and day. If I’m going to the trouble of shooting 5x4, I want night and day. The image above shows a step towards solving this issue, albeit it entails a digital pathway rather than a silver one (which does inevitably make the unrealised darkroom print my elephant in the room, for now). I had the negative in question scanned by a lab to make an impressive 281 mb file. That is approximately 93 megapixels of information. 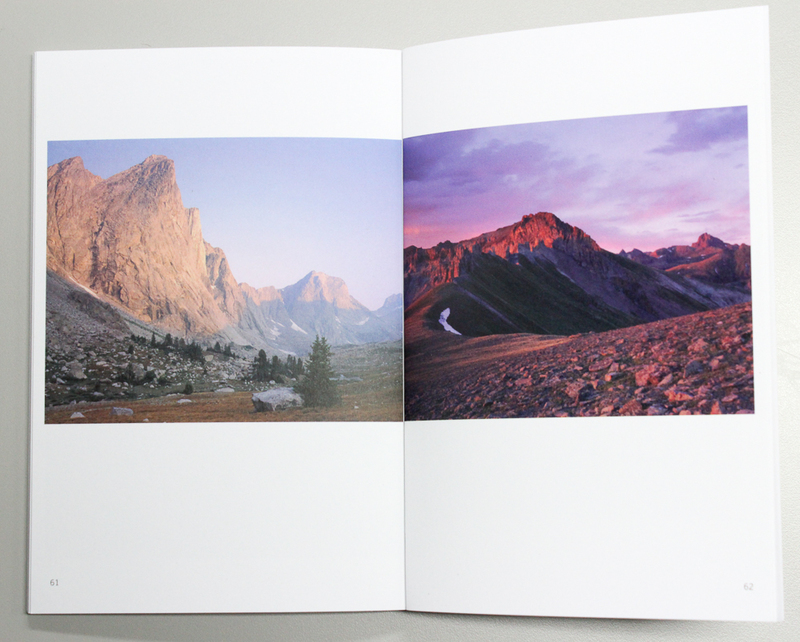 I prefer to print my own images wherever possible, due to the control of the workflow I have already referred to. I would, however, out-source a large print providing I had been able to work on and study small sections first. You will see that the subtext here is that 5x4 does indeed provide a means of providing the kind of large print I envisage making (others will not be surprised, but, given my philosophy of seeing for myself, this is besides the point). Even in its somewhat improvised state - and I have only processed it to a limited extent too - it is an impressive thing. There is no sense of the tonality ‘running out’ that you sometimes see with 35mm enlarged too far. There is hardly any visible grain at all (the negative is Delta 100 developed in Perceptol). The central trees offer a clear structure to the ‘overall’ image, and yet, as a somewhat busy image, there are lots of little episodes and separate dioramas to enjoy. 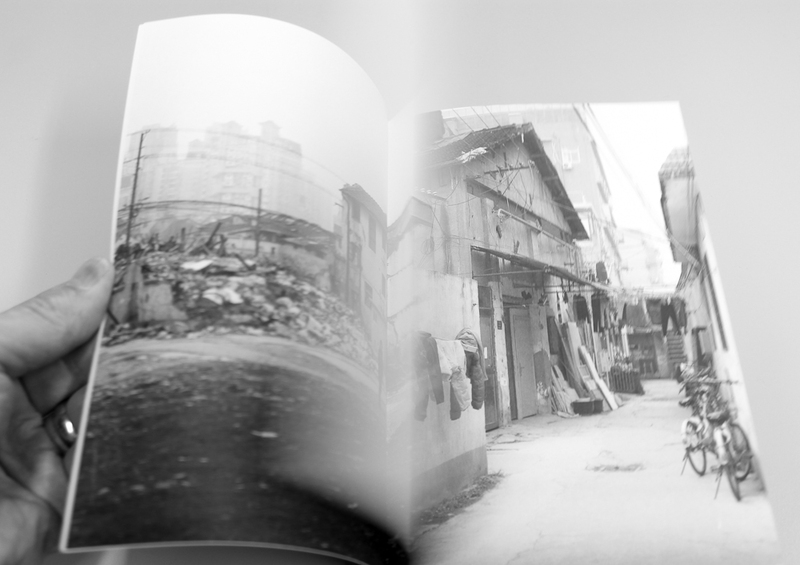 A tiny section of the above print showing the effects of the multiple exposure. You can see the distinct movement of the branches in the central area. The big print underlines some technical issues too. I remember being concerned about accurately timing the indicated exposure of two and a half seconds. I decided to make three separate exposures (thus leaning on my shutter’s accuracy), but had underestimated the effects of what I thought to be a gentle wind. You can clearly see where branches and leaves have moved between exposures. 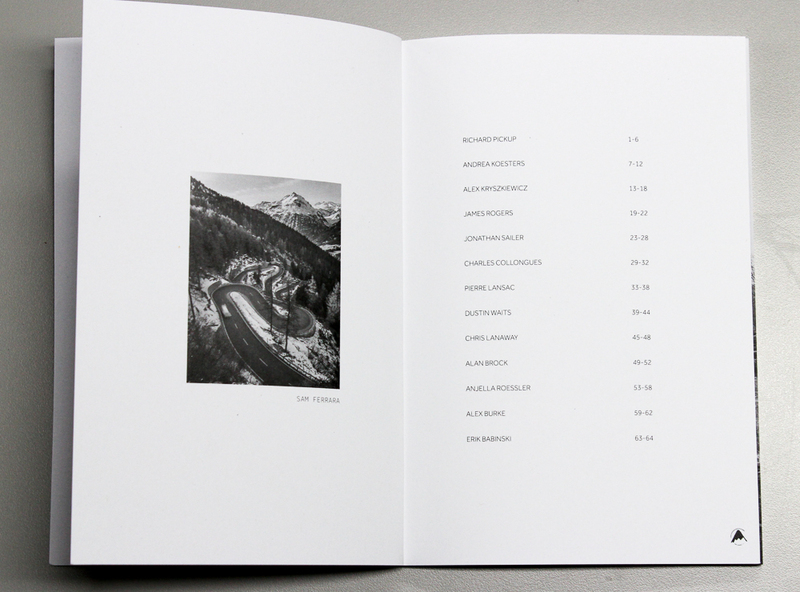 Hardly discernable in the contact print, but clearly evident in the enlargement. This is a great example of information that will now be fed back into the earlier stages of my process. I hope it clarifies what I said above and that the reader can see why I wish to be looking at the proposed product (print) in the way I do. I now know what my materials and equipment will do in a given situation should I want to make this type of print again. This somewhat improvised print may well then prove to be something of a quiet milestone in my work with 5x4. Happily, there is work to be done, but this is an essential technical step to formulating what will ultimately be my artistic response. My adventures in 5x4 continue, if a little slower than I had originally envisaged. In the style of contemporary reviewers, I’m going to offer my conclusion here at the start. The Intrepid is a superb camera, consisting of the right compromises of design and cost, and ideal for those who are looking to make a first foray into large format. It is, in essence, a great ‘learning’ camera: affordable, light and straightforward to use. I write this review as an experienced photographer, especially a 35mm one. I don’t have familiarity with a wide range of makes and models of large format camera. If you are looking for commentary on how the Intrepid compares to other, perhaps more refined (and almost certainly expensive models), I’m afraid you will have to look to other reviews. It is a fact that other models offer additional movements that the lightweight Intrepid does not. As you will see shortly, I am inclined to see the Intrepid in the context of its budgetary brief and accompanying design compromise. As a small format photographer who has a long-held ambition to get into large format in a more serious way (I have dabbled in the past), I reason I may be exactly the kind of person the Intrepid is marketed to. That puts me in a good position as a reviewer. The 'naked' Intrepid, with the lens yet to be mounted. So what greets you when you open the box? The Intrepid is made in a small workshop in Brighton and immediately strikes you as a handmade object. It is constructed mainly from birch plywood, along with metal and plastic knobs, threads and gears. The aesthetic is resolutely ‘utilitarian’, and to my eyes, there is a certain beauty in this. The camera is constructed form birch plywood and mainly metal parts. The finish is rugged, business-like and a little, well, unfinished - by which I mean it is not sanded and treated to the smooth furniture-like skin of other more senior models. We are meeting here some of the compromises of which I wrote a moment ago. (As this review progresses I will develop this idea of compromise because I think it is essential to arriving at an informed judgement.) Along with the finish, one also notices a characteristic smell. The wood is protected with and has the sweet smell of wax. This smell persists as you put the camera to use, and I personally found it pleasurable and evocative of my experience with the Intrepid. The camera in it folded position, tucked away, and taking up minimal room, in my camera bag. The camera begins folded down, and, with some simple movements and a little tightening of the appropriate knobs, is ready for business. The rear of the camera simply folds up at a ninety degree angle and this, when tightened, is where it is left. The designers have decided to leave the rear standard without adjustment and this simplifies setup and use (although naturally reduces flexibility, especially if you are use to extensive movements). The front standard is more complex offers rise and fall as well as tilt and swing. The camera's front standard, set in the 'rise' position. The bellows are flexible, if a little stiff to begin with, and extend far enough to offer some great close-focussing. The camera takes Technika style lens boards and will accommodate a wide range of lenses from what, at the time of writing, is a very plentiful second hand market (I can’t see anyone buying a new large format lens for an Intrepid, but I suppose folks have their own circumstances and needs). The rear of the camera is interesting and has been very carefully thought through. The camera comes with a ground glass (with useful grid lines etched on), and the focussing plate is attached with thick elastic rather than the more conventional springs. The back is eminently flexible, having Graflok clips, and will accommodate a wide range of alternative backs (polaroid would be one obvious choice). The mechanism for changing from portrait to landscape is of the rotating kind. One simply puts one’s finger in the corner at the rear and with a gentle push the rear section (complete with ground glass) will spin and the format change is achieved. A great mechanism (I believe there is a round metal track inside) that is very practical. Switching from portrait to landscape is surprisingly easy, thanks to the rotating back. It is all very well considering the camera and its controls in isolation, but how did I find it to use? In short, it was a pleasure. Large format cameras are essentially simple things, a frame to hold film and a lens at the other end, with a spacer (and darkness, one hopes) in between. Indeed, it is somewhat ironical with large format photography that while the equipment becomes much simpler than sibling formats, the shooting procedure is complex and very demanding of the photographer. The workflow has many aspects, and with that, many ways to make mistakes. One of my first shots with the Intrepid. Scan of a contact print on warmtone resin coated paper. Film is Ilford Delta 100. It does take some time to learn how to setup and use the Intrepid, but this soon becomes second nature, and really the time it takes to get the camera from folded to shooting is very short indeed. There are a number of knobs that need to be tightened, as described above, and one soon learns where these are and how much pressure needs to be applied so as to get solidity without risking damage to the camera’s threads. There are three different positions for the front standard, depending on the focal length of lens you are using. These are usefully marked out for you, and there are metal female threads to receive the securing knob. The front standard itself has a notch cut in it that the screw shaft goes through, and I did wonder whether a metal part here would guard against wear in the longer term. Pure speculation on my part, because I haven’t tested this for any great time (nor can I, yet) and the wooden notch may prove to be tough and perfectly adequate. I was quite surprised to learn that glass had been used to make the focussing screen, largely because I expected that, given the cost of the camera, this was a logical place for a plastic alternative (and thus a saving). The Intrepid Camera Company should be applauded for their commitment to quality here. I was using an f5.6 lens and generally found the screen to be bright enough at this aperture. It is trivial to change the screen to a brighter model (finances permitting of course), and something I can see myself doing in the future. Again, I think what you are given with camera is completely in keeping with the philosophy of Intrepid - the camera is ready to go and will serve you well as it is. 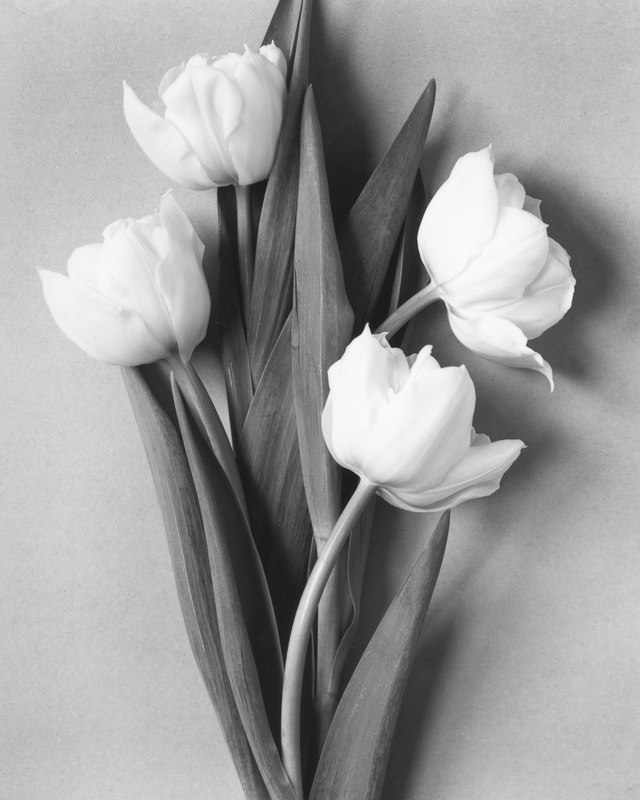 A still life demonstrates the close focussing abilities. Here the bellows are extended, but could extend more. Another scan of a contact print and again Delta 100 film. Next comes inserting the film holder and making the exposure. Of the many aspects of large format workflow that will be new to the 35mm photographer, this operation is perhaps the most intimidating. It's intimidating because, once the film is inserted, you have gone ‘blind’ (no more image on the ground glass). Not so much of an issue with static subjects on a windless day, but with real live subjects, a whole other level of challenge. Having said that, I should remind myself that a goodly part of my own motivation to shoot 5x4 is precisely this kind of risk - and thus excitement and anticipation - that the process provides. Take away such elements and the possibility of significant mistakes, and the victory of a well-exposed sheet of film is surely less sweet. I wanted to test the Intrepid in a wide range of circumstances, including in the studio. The moment of exposure was nerve-wracking, as mentioned in the text. Film is Kodak Ektar 100. Many thanks to my colleague Chris for kindly agreeing to be a subject. The camera did perhaps play its own role here. There is considerable movement when the film holder is inserted, and one has to be really careful not to knock anything out of position (remember, you have done your critical focussing at this stage and want all elements to remain exactly where they are). 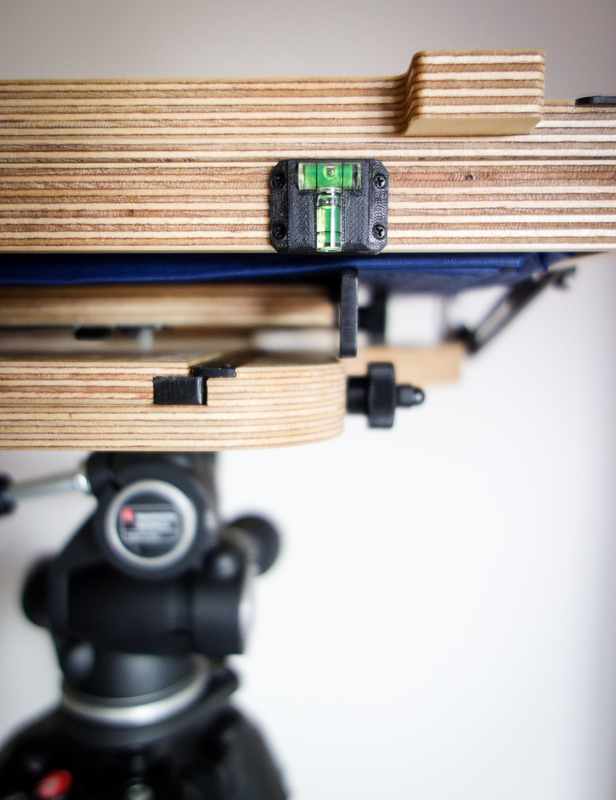 The elastic that holds the focussing screen section in place is pretty strong, and in a way needs to be, but this does contribute to stresses and strains on the camera body as the holder goes in. My solution has been to disengage the top two elastics to allow the film holder smoother passage. I don’t think there’s too much the designers can do about this, it is, after all, simple physics, given the materials and construction involved. I should also note that I haven’t seen any discernible impact of this on actual images, even those shot wide open. At smaller apertures depth of field will allow greater play and allow more margin for error. An environmental portrait of my colleague David (thank you to another generous sitter). Scan of a contact print, this time Ilford HP5+ film. Before I move on to my conclusion, I’d lastly like to address the question of weight. You don’t need to have extensively handled heavy large format cameras to know that the Intrepid is a light camera. Weighing in at just 900 grammes, it is a camera that will surely encourage use and will doubtless be picked up by photographers ahead of their other large imaging systems. The question of what you can carry depends on a number of individual variables, such as where you are travelling to and how, and of course your own physical strength and capabilities. A mature Magnolia tree bursting into bloom provides plenty of colour for sunshine-loving Kodak Ektar 100 film. This is surely the wrong comparison to make, but next to my other kits there is no doubt that my Intrepid bag is noticeably bulky and heavier. I don’t think that would prevent me from carrying the Intrepid however, and I had at any rate employed an old bag replete with pockets and padding, and can imagine formulating a much more compact kit based on alternative bags (the market is hardly bereft of options today). 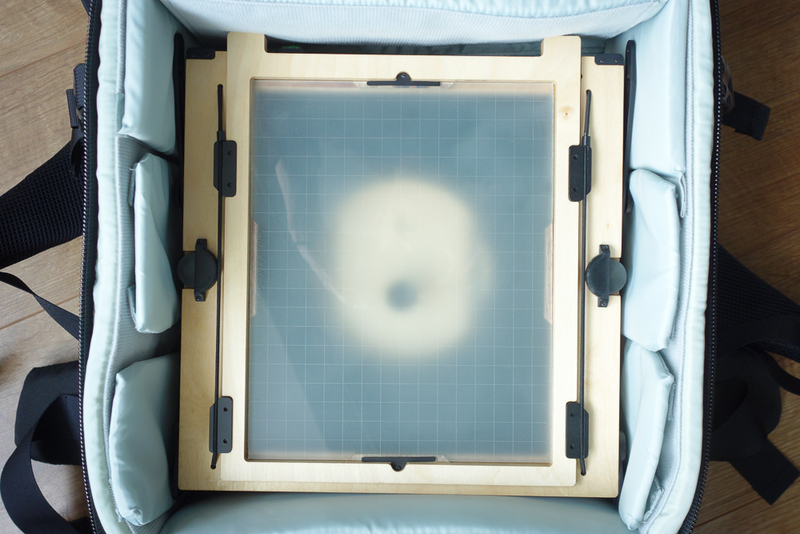 In summary, if you are new to large format, you will not be able to avoid the bulk of film holders, dark cloths, loupes, lenses, 5x4 film and so on; but you have a huge advantage with the Intrepid as your camera of choice. The detail in 5x4 negatives is impressive. With top class scans very large prints are possible. Film is Kodak Ektar 100. I now want to end this review with a little qualification of an earlier statement about design choices, because this will help form my conclusion and is the basis of my high regard for the Intrepid. I think there are a number of areas where the Intrepid could be improved, some of which have been raised here (and will be raised in other reviews). Yet we do have to bear in mind the design brief for an affordable, lightweight, accessible 5x4 field camera. The work of design is in essence the work of compromise. You have a set of constraints, financial and practical, and must make the best decisions you can to fashion the product you want. Would the camera benefit from built-in spirit levels? Sure. Could the finish be more refined? Absolutely. Could the camera be sturdier? Perhaps. Yet we are beginning to speak of an altogether different object, a thing belonging to an altogether different budget and design brief. The point for me is that the Intrepid’s designers have made the right set of compromises, given their own brief. There is even a hint of wizardry, given what they have achieved in a product that retails at £250. I had to wait about eight weeks to receive my camera after I had placed my order. I simply accepted this as part and parcel of the aforementioned limitations and parameters (and, in truth, rather enjoyed the anticipation - it felt rather bespoke too, knowing that my camera was being made ‘for me’). In other words, if you want your camera faster, with more supporting products, better build quality and guaranteed longevity, you will simply have to look elsewhere (and be prepared to pay for the privilege). 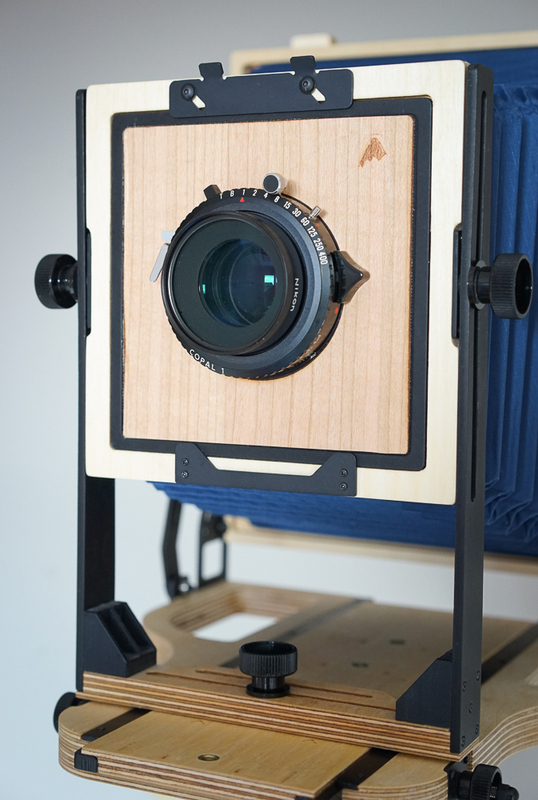 If you are beginning in large format and want something that is going to work straight away (excepting lens and film holder) and do a fine job, look no further than the Intrepid. The Intrepid camera, bellows extended, focussing close up on a little still life. My large format adventures have begun in earnest and I’m starting to build some familiarity with the Intrepid field camera. I have a few observations and feelings to share with you right away, but am working on a more detailed review of the the Intrepid which will be coming soon. If you think you might be interested in taking up large format (LF) photography, or, if you are already into it and are considering buying an Intrepid for its weight advantage, please do check out my review. The common wisdom on the nature of photographic formats has already taught me very well that I should expect to ‘slow down’ when doing LF. Surely this is true, but I have discovered other concerns in what little time I’ve had with my new camera, and have been given pause to reflect on some interesting considerations. First, there is the physicality. LF is a physical and tactile operation. I was given good advice to simply learn how the camera works, without worrying about making any pictures. I am impatient too, so make pictures I did, and was aware that there is a great deal to set up when making a LF image. LF is not something the photographer is going to enter into lightly. There needs to be a very good reason to make an image. You can’t bury a number of cheap shots and ‘fun’ indulgences as you can on a roll of thirty six frames. There’s simply too much time and cost involved, and you are heavily invested in the image you have made. It seems the stakes are very high with LF, but the payoff is substantial if things come together. Every large format image made will be an investment in time and money. No indulgent test shots here! Now while my fingers had a great deal to contend with, I quickly learnt my way around the camera and before too long became much more confident. This really is like using a manual 35mm film camera, in the sense that, once learned, your brain goes into a kind of ‘autopilot’ mode, a bit like a driver who stops thinking about gear changes and clutch sequences and simply drives. Hand me any one of my digital cameras, with their formidable menus, and I wager there is something I will have forgotten how to change or access. The re-learning feels continuous with digital because of this. I think it’s going to be very different with LF. I can hardly claim to have learned all the movements and workflow nuances, but it does fill me with confidence that my investment in effort and time will result in a thoroughly ingrained, automatic, practice. I guess we might say that this is just as well because there is a lot to deal with! As a 35mm photographer the loss of the ‘image on the fly’ was immediate and obvious. It’s no exaggeration to say that with 35mm I am looking to make pictures all of the time. If an opportunity presents itself, the small camera comes out, does its work in one hundred and twenty-fifth of a second (allowing for a few more seconds of decision making and a pause for the right moment), and is put away. One can be ‘out there’ photographing and go largely unnoticed. My not-so-discreet Intrepid, complete with red bellows. Not a machine for stealthy street photography. With LF I am really going to have to want to take an image. I am going to stand there, for some considerable time (hoping my technique is getting more fluid, but certainly not wishing to rush the workflow and get it wrong, and there are so many ways to get it wrong! ), with my handsome but attention-grabbing red bellows (did I choose the wrong colour? ), standing, senses momentarily muted, under a dark cloth, trying so very hard to concentrate on exposure values, aperture choice, subject movement, and so on. Oh please don’t let anyone try to talk to me! The secluded spot in nature suddenly looks very attractive while I earn my stripes. And then there is taking LF images of people. I am curious as well as impatient, and there was no way I was going to omit this type of image making from my early experience. Yet it is a curious thing! You are thoroughly shackled by formality, and have to look for an instance where your subject can be ever so slightly natural, in an essentially unnatural situation. You must place your subject and weigh-up the lighting in the scene. It is actually preferable to scout or adjust your scene before your subject arrives. If light modification needs to happen, it is best done in advance. You are going to have other things to worry about when your subject is in place. So your sitter arrives and you settle on a pose. You carefully survey the image on the ground glass. You have to keep engaging your subject - as any portrait photographer does - as you begin to check your workflow and finalise decisions of exposure, aperture and shutter speed. You make and check focus. You are still talking. Still engaging, showing that you are in control. Then comes that curious moment, the reason I write of a shackling formality. You insert the film holder and are now working ‘blind’. You have requested your subject to stay in position, but have not yet pressed the cable release. You are faced with a Hobson’s choice: expose too early and risk a wooden pose; leave it too long and your subject will have strayed from the zone of focus and changed your composition. You are in search of a ‘moment’ within a moment. A happening in an ever-so-modest window of time. It is a wonder LF portraits are ever made! Excuse me if I exaggerate for effect, but I think these observations have a validity and point to real differences in photographic formats (I’m assuming here that medium format is in many ways closer to 35mm than LF as far as the above is concerned). I have naturally made some exposures, and while I have perhaps inevitably made mistakes, I have had some successes too (it is true, LF portraits can be done). I hope to share these and some observations about them in a forthcoming post. A test strip of my first large format portrait dancing in the wash. This could well be proof that large format portraits can be done. Watch this space for some more of my adventures with this venerable format. What's special about a film portrait? The other day I came across a photographer wrestling with the task of capturing his daughter on large format film. He declared, with some modesty given the skill he showed in his images, his attempts a failure. I got the sense he would triumph, however, his declaration being at any rate interim in nature. Large format photographers are not strangers to difficulty (their medium certainly brings its challenges) nor are they afraid to pursue highly individual whims and visions. It would be easy to dismiss this gentleman as a maverick, and to retire with a sigh, saying something like ‘wrong kit friend, try 35mm and continuous focus for better results’. Yet an essential part of this photographer’s vision, the look he desires, is 5x4 film. It is a very particular look. And film. Something I fully appreciate in the endeavour is the idea of committing a person’s, nay a loved one’s, visage to film. So in mulling this over, I set myself the task of expressing what exactly it is that makes a film portrait special. The obvious comparison is with digital, so why choose film instead? The answer I have so far come up with may be no more than a kind of illusion, a piece of analogue nostalgia in an increasingly digital time, a fool’s gold of image making. When I think of my own film portraits, I think of the silver gelatin crystals in the negative that have reacted to the light that emanated from the subject. Physical stuff, now tiny grains, that make up an image. A person, etched in a transparent medium that becomes, through the further action of light, a physical photograph to hold in wonderment. When the negative (or the photograph) is in my hand, I hold a token of a causal connection to the being who was once before the camera. I believe semiologists call this kind of relationship between sign and thing represented ‘indexical’. Like footprints in the snow signalling someone’s presence. Now, digital is of course no less physical than film, hence my talk of fool’s gold. Yet the physicality of digital is, well, just not very physical. Many others have pointed out that images on memory cards and folders on computers are ephemeral. Negatives and prints, by contrast, support the romance of the imagined connection to a person that a portrait fosters. Like a Proustian smell, they are evocative and sensory, and nurture memories. The negative in my fingers is like a little light trap; a special light that really came, indexically, from the person caught within. My ruminations don’t address the ‘look’ of film as a factor, but I think this isn’t the best place to look for distinctions, at least not on its own. I use and enjoy film simulation presets on my digital shots. These go a long way to imitating film (although not the whole way, for further technical reasons involving focal lengths and formats, old lenses and so on). It is not (just) the look of film that makes it special. It is that and the gravitas of the physical light trap of which I write. Digital pictures image people; film ones bear their imprint.